It's been pretty crazy over here. After a busy week of houseguests, birthday celebrations, and other grown-up things that come with turning 30, I've been a bit quite here on the blog. Now that things are getting back to normal and the weather has been a bit grey out, I knew I had to get back down to business. I've been hoarding summer berries over here like a mad woman. A couple weeks ago it was these raspberry gems, but today it is all about strawberries. I honestly can't seem to get enough of 'em. Every time I go to the grocery store and see ripe, organic strawberries on sale, I must buy some. After my week long "stay-cation" while we had friends visiting, I've been itching to get back to baking. I wanted to make something simple and conventional to share with you all. I chose this oldie but goodie, a cake roll recipe. 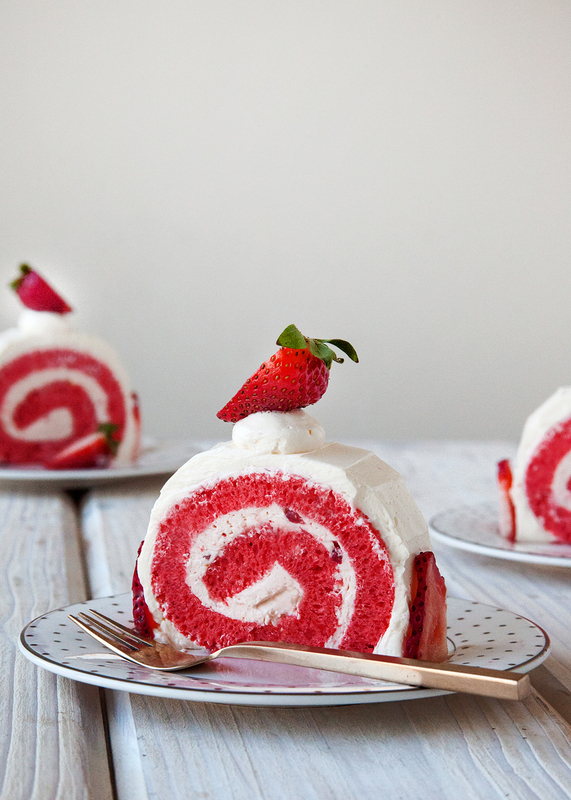 A Berries and Cream Cake Roll, to be exact. It's fun, whimsical, nostalgic - literally all wrapped up in one. With a combination of freshly chopped strawberries and a bit of strawberry preserves, the berries and cream filling is just what summer needs. Skip all the fancy tricks and decorated with nothing other than more beautiful, fresh berries. Sometimes you just need more sprinkles in your life. When I owned The Frosted Cake Shop, my clients made sure I knew what was hip and cool with all the kiddos. Not being a mother myself, making birthday cakes for a living was a good way to know what was trending amongst toddlers. From pinks and pastels to rainbow-layered cakes boosting the newest cartoon characters, I regularly got to embrace my inner child. Now that I have switched gears a bit in my career, wedding cakes are not the only designs that have become a rarity in my kitchen. Now that I have transitioned into more of a recipe developer and food writer, I find myself too often caught trying to come up with sophisticated, unique flavor combinations and complicated recipes. Some great results come out of this way of thinking, but sometimes you just gotta back off the forced creativity and have a bit of fun. I decided to start the new year with a bit whimsy while sticking to a classic flavor: strawberry. Sometimes flavors as ordinary as strawberry get over-looked (by me at least), but there has to be a reason that strawberry-flavored treats are so popular. Oh yes, that's right - because strawberries taste amazing! Ripe, juicy ones, that is. I decided to take two fresh and fun ideas and put them in one cake: strawberries meet sprinkles. This Strawberry Confetti Cake was built from both strawberry and vanilla sprinkle layer cakes with strawberry cream filling and confetti buttercream frosting. Kind of like that boxed funfetti cake mix I ate as a child, but strawberry- and better, obviously. The fresh strawberries give off a taste refined enough for the adults, but the design will certainly get any child eager to dive right in. Prepare two 8inch pans and set aside. Place butter in the bowl of an electric mixer. Beat on high with a paddle attachment. Add in the sugar and beat until light and fluffy. With the mixer on low, add in the eggs, vanilla, and strawberry puree. Stop mixer and scrap down the sides of the bowl. With the mixer on low, add in half of the dry ingredients. Add in the milk, followed by the remaining dry ingredients. Pour batter into prepared pans and bake until done (about 22 minutes). With the mixer on low, add in the eggs and vanilla. Beat together cream cheese and butter with an electric mixer. Carefully add in the remaining ingredients, and mix until smooth. Add a bit more confectioner's sugar or puree to achieve desired consistency, if necessary. Place sugar and egg whites in the bowl of an electric mixer. Gently whisk together. Place on top of a medium saucepan of water to create a double boiler. Heat until egg mixture is hot to the touch. Once hot, transfer the bowl back to the mixer fitted with a whisk attachment. Beat on high until bowl is back to room temperature. Stop mixer and swap out the whisk with the paddle attachment. Add in the vanilla and mix on medium speed. Add in the butter and beat until smooth. Add in desired pink food get color.